Habit: Annual, perennial herb, occasionally mat-like, often rhizomed. Stem: decumbent to erect, +- clumped. Leaf: basal and cauline; sheath open; ligule membranous, entire to irregularly toothed, occasionally with 1 large tooth on each side; blade flat to rolled. Inflorescence: panicle-like, narrow to open; branches spreading to appressed. Spikelet: generally single (bisexual) occasionally paired (bisexual, staminate or sterile); glumes subequal, generally 1--3-veined, short-pointed to awned, upper glume occasionally 3-veined; florets 1, occasionally 2; axis breaking above glumes; lemma short-pointed to awned, glabrous to hairy, 3-veined; palea <= lemma. Fruit: +- fusiform, red-brown, generally falling with lemma and palea. Species In Genus: 173 species: temperate America, southern Asia. Etymology: (G.H.E. Muhlenberg, Pennsylvania botanist, 1753--1815) Note: Reports of Muhlenbergia dumosa Vasey, Muhlenbergia glauca (Nees) B.D. Jacks., Muhlenbergia thurberi (Scribn.) Rydb. have proved to be erroneous. Habit: Perennial herb; rhizomes shiny, scaly; +- stoloned. Stem: decumbent to erect, 1--6 dm. Leaf: ligule 0.2--1 mm, truncate, minutely ciliate; blade 2--6 cm, 1--2.8 mm wide, flat or folded. Inflorescence: 6--17 cm, 5--14 cm wide, ovoid, open; branches 5--14 cm, spreading. Spikelet: glumes 0.5--1.5 mm, acute; florets 1--2; lemma 1--2 mm, glabrous +- short-awned; anther 1--1.2 mm, purple. Chromosomes: 2n=20,22,28. 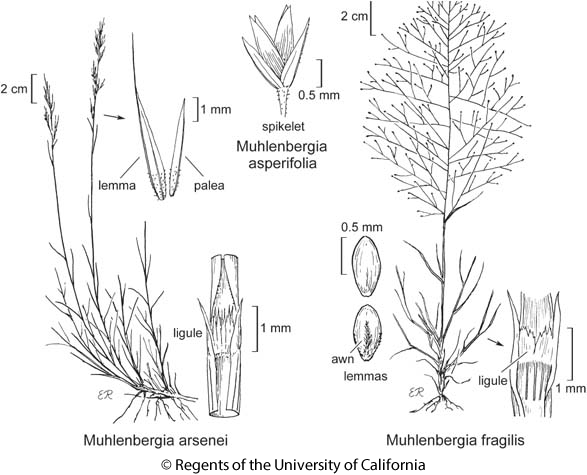 Citation for this treatment: Paul M. Peterson 2012, Muhlenbergia asperifolia, in Jepson Flora Project (eds.) Jepson eFlora, http://ucjeps.berkeley.edu/eflora/eflora_display.php?tid=34061, accessed on April 19, 2019.